For this week's new release, Megan Turnidge, GG Digital Designs and I collaborated together to bring you an absolutely precious kit. Angel of Mine is a charity kit to benefit the Now I Lay Me Down to Sleep organization. We have a friend who was recently touched by this organization and this kit is in memory of her sweet Alexis. Please read the product description to learn more. This sweet kit is so beautiful, and perfect for scrapping your baby photos. This kit is packed full of gorgeous elements and soft papers. It has enough to scrap both boys and girls. 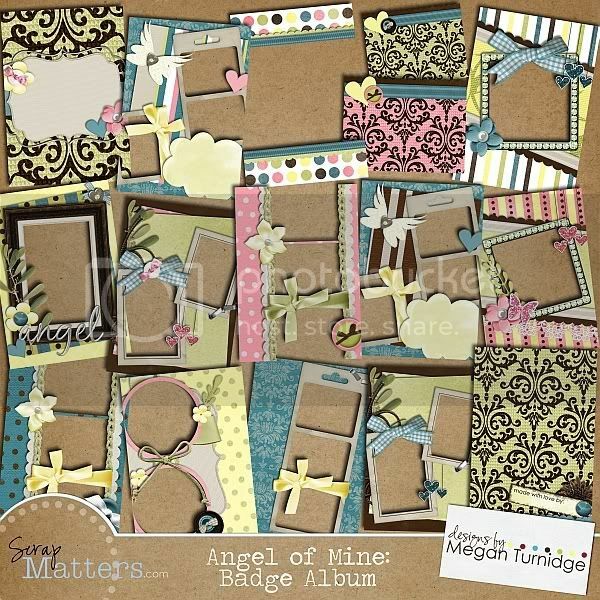 In addition to this beautiful kit, you will also receive 4x6 brag book QPs, badge album QPs, and a large set of gorgeous 12x12 QPs. The kit is HUGE. $10 is such a small thing you can do to give back to others and help families who have lost their little angels. There's never been a better reason to purchase a scrap kit. We are not making any profits from this bundle. It's all going directly to this charity, so PLEASE do NOT use any discount or gift coupons on this charity bundle! We appreciate your cooperation! !